Since the dawn of man, humans have always enjoyed a good monkey story. The Monkey King of Chinese mythology is sort of a super monkey, who cast spells, is an expert at wielding his compliant rod, or staff, and who can leap something like 30,000 miles in one awesome somersault. Even today, we go ape for primates. The 1998 film Mighty Joe Young reintroduced the world to 1949’s Mighty Joe Young, a gigantic freak gorilla. We may not have dished out nine dollars to see the movie (nor did we rent it for five), but the fact that it exists makes us feel better. Benjamin Hale’s frisky first book, The Evolution of Bruno Littlemore, details the rise and fall of the world’s first speaking chimpanzee. The rise, of course, is that Bruno Littlemore, chimp extraordinaire, learns to speak. In fact, he doesn’t just learn to speak; he becomes more erudite and elitist than most humans. Think Harold Bloom with baser instincts and a higher passion for peaches. Bruno’s narrative isn’t the simple, direct language you’d expect from a talking monkey—this is lyrical play, an anti-humble Humbert Humbert handling: “With some prodding I have finally decided to give this undeserving and spiritually diseased world the generous gift of my memoirs.” And it is generous. The chimp’s tale is close to six hundred pages. Why does Bruno talk so much? Because now he can. and so on. But English does come, and Bruno masters it. In fact, he becomes a creative genius, painting, putting on Shakespeare, turning into somewhat of a renaissance ape. The world is his oyster as he becomes more human. But there is the fall. Bruno kills someone. The book is purportedly dictated from a primate research facility. Punishment is coming. But until then, he must, as Nabokov would say, get rid of this story. One of the book’s best elements is its daring to tackle the big monkey/human issues. There’s the initial species-ism—I now feel ashamed that I can’t tell a monkey and a chimpanzee apart—in which the world is initially fascinated then disturbed by Bruno. There’s interspecies relations (not sure what to call this; jungle fever is taken) and there’s the inevitable shift in Bruno’s appearance, a Michael Jackson-like grotesque attempt at plastic surgery, all in a depth charge of lingo-etceterata. The Evolution of Bruno Littlemore, like other mammoth firsties of this sort (The Broom of the System, Catch-22, A Confederacy of Dunces), is that fresh bit of young writing where the fun is in the baroque, in the cacophony, in the love of language. The result is a fantastic book that sits on the shoulders of giants, grooming, perhaps, a genuine pleasure for people who love books. J.D. 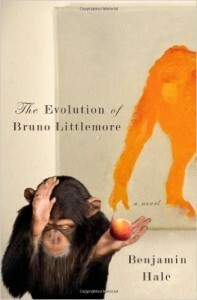 Reid’s review of The Evolution of Bruno Littlemore first appeared in TLR’s Spring 2011 issue, Emo, Meet Hole.